Challenged and vibrant at the same time; noisy yet deafeningly silent on critical issues in the same instance and successful yet inefficient in matching the steps of a young nation – are dichotomies that succinctly sum up the state of Indian democracy today. The book goes beyond semantics and critically analyses issues of fundamental importance in the framework of the dignitarian goals of the republic, the role of a ‘living Constitution’, the necessity of equilibrium between executive, legislature and judiciary, the role of media, importance of equitable growth, a responsive justice system and a rising India’s engagement with the world. It provides a statesman’s perspective on addressing challenges and optimizing responses with a view to transforming our democracy as a true reflection of the collective conscience of the nation. 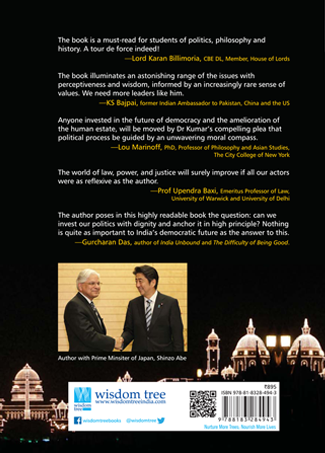 Seeking to espouse a non-partisan view, the author – a distinguished lawyer, former parliamentarian and union minister – provides not only a practitioner’s view on challenges faced by Indian democracy in the twenty-first century but also a thinkers substantive vision of the qualities of democratic leadership across the world. 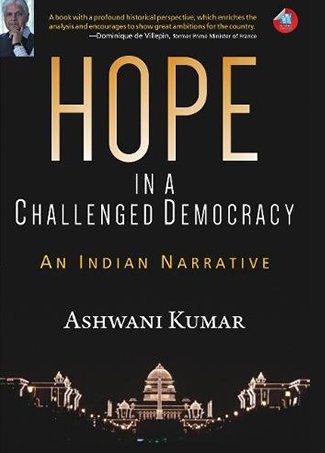 Hope in a Challenged Democracy is a must-read not just for practitioners of statecraft and politics, scholars and intellectuals, but everybody who is concerned about the state of our nation and the world. The book is all set to be launched in New Delhi on April 10, 2017 by Dr. Manmohan Singh. The function will be presided over by Shri Hamid Ansari, Vice President of India, as the Chief Guest. Shri M. N. Venkatachaliah, former Chief Justice of India, will be the Special Guest. The event is likely to be attended by eminent personalities from different walks of life. "A book with a profound historical perspective, which enriches the analysis and encourages to show great ambitions for the country." "Anyone invested in the future of democracy and the amelioration of the human estate, will be moved by Dr Kumar’s compelling plea that political process be guided by an unwavering moral compass." "The book is a must-read for students of politics, philosophy and history. A tour de force indeed!" "The book illuminates an astonishing range of issues with perceptiveness and wisdom, informed by an increasingly rare sense of values. We need more leaders like him." "Dr Ashwani Kumar distils a rich political and juristic life. The world of law, power and justice will surely improve if all our actors were as reflective as the author." "The author poses in this highly readable book the question: can we invest our politics with dignity and anchor it in high principle? Nothing is quite as important to India’s democratic future as the answer to this question. " "Ashwani Kumar’s book holds fast to the Hope asserted in the title. It is not a facile hope, because he is candid and hard-hitting in identifying the challenges that India faces (internally, and in world political and economic affairs), and the disasters that politics can yield in the world’s largest and most complex democracy. The Hope of the title lies close to Dr Kumar’s work as a lawyer and in politics, and it centres on constitutionalism. For the Hope lies, as he puts it in one of his lambent phrases, in the possibility of ‘civilising ourselves in the use of power’."